Interesting Fact: The Philippines is the world’s largest producer of coconuts! Have you ever gone to the grocery store in the USA or from your country and purchased mature coconuts? The coconut meat was very hard inside, right? Or you may have visited your local Asian market to buy young coconuts. 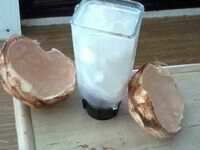 Those contain the soft jelly or soft meat of the coconut which is perfect to blend into a healthy shake! 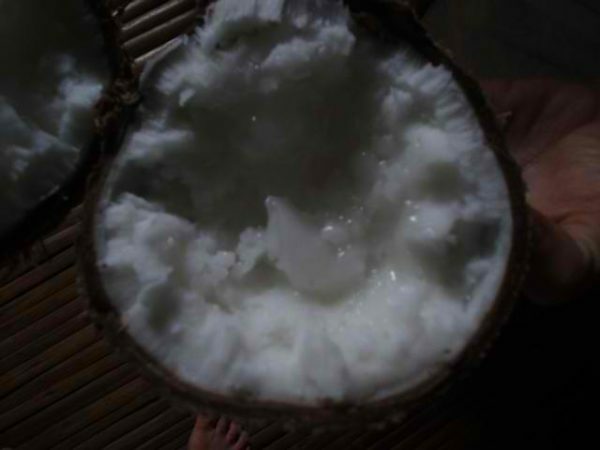 The Palawan coconuts that we enjoy are of both kinds! Jeff loves to blend the coconut juice with the softer meat into a nice shake! If you like your coconut shake to be more like milk consistency blend longer like 20-30 seconds to your preferred consistency. 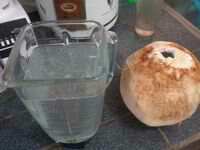 How to Make A Coconut Shake! For those that enjoy Coconuts or rather Buko over here in the Philippines, we created a quick video demonstrating how to do that pretty much. It’s a quick 2 minute video. Hope you enjoy! Jeff, that be me! Enjoys this shake several times a week. Sometimes 2-4 coconuts in 1 day. Sometimes, I go with no coconuts for a few days or a few weeks. Preferably, however, I would like to eat them every day. Whenever I get heavy into windsurfing again, playing 3 on 3 basketball, gardening, etc. outside then maybe I’ll consume 3-6 coconuts a day? Not sure yet. But, wow, I go cuckoo for coconuts! Grace and I go do some of our shopping over at Robinsons Supermarket here in Puerto Princesa, Palawan. There we choose the hard, mature coconuts. They split them open. Then they grind the coconut meat for us into a bag. We pay and go home on the Jeepnee. Then Grace transfers the contents of that bag of shredded coconut meat into our juicer. After she is done running it through our juicer out comes coconut milk! From there she cooks vegetable dishes with that. And also in our chili! I got to tell you it just doesn’t get better than that! The flavor of the coconut in our cooked dishes is out of this world. We tend to overeat a bit I guess because it tastes so good. Masarap! That means delicious in Tagalog. Tagalog is the official main language of the Philippines. I’ve not as of yet August 2014 seen any Macapuno Palawan Coconuts. But they must be here somewhere. 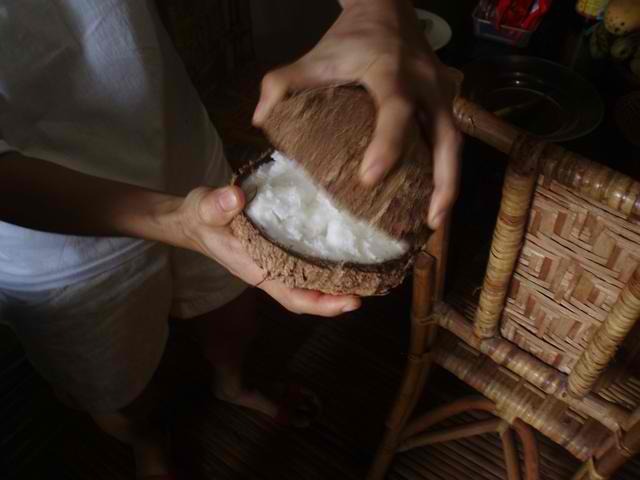 A unique and rare coconut of the Philippines is called the macapuno coconut. 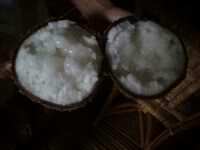 This special coconut already contains the virgin coconut oil (VCO) already to go! That is nature has already prepared for you to eat and enjoy! But, it’s difficult coconut to find. Unless you live right next to the coconut palm tree like we did over in Mindanao, Philippines. 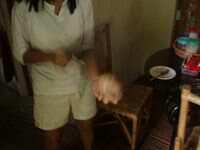 Below is my girlfriend opening one from her sisters coconut palm tree. We’ve had several that contained majority coconut oil! Unbelievable and quite amazing! I had never heard of this until 3.5 years ago back in 2011 Have you ever seen anything like this before? Step 3: Time to spoon out this awesome Macapuno VCO. Ready to eat! Wow, look at that VCO (Virgin Coconut Oil) It doesn’t get better than this!